Welcome back to the BEST blog interview series. Today I have the pleasure to introduce you to Louise, on Etsy she is also known as Bibliographica. - To meet her live and in person you would have to go to Waiheke Island, New Zealand. We just barely missed her 1st Etsy-Birthday which was on January 27th. Hi Louise, nice to meet you, and congratulations to your one year old shop! Tell us a little about it: What do you make and sell? I make journals, books and sketchbooks by hand, and use predominantly recycled materials to do so. Everything is made by me, and is unique – I’ll never repeat the same journal twice although I could attempt something similar. I also sell my photographic prints which are botanical collages and contain old letters, postcards, fabric, miscellaneous paper ephemera relative to the object, and flora and fauna native to NZ. Do you have a favorite material or technique among those that you use? The paper I use has varied over the years but I have found I prefer the Incisioni Cartiere Magnani paper or Fabriano’s amazing Eco paper. Both are lovely to work with and have beautiful surfaces which respond well to most mediums. This way you can please everyone! I like to hand tear and tea-stain my papers, which I then lay out flat on a plastic sheet and then press when dry. I like things to inspire the artist or writer. Not everyone likes tea-stained pages though. So it’s not something I do all the time. It’s good to have a mix. I love to make really grungy rustic leather covers and I love to find bits of leather for that part. I have so much and sometimes it will take me a long time to find the right piece that works. I like to find bits that have straggly corners or natural formations that I can leave there and use to my advantage without having to cleanly cut it to size. I like things to look a bit imperfect, have a bit of an edge. 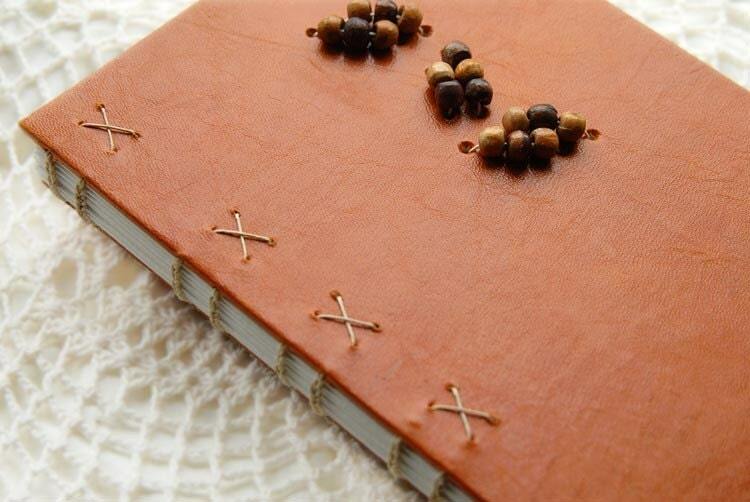 I love to Coptic bind, it’s a beautiful process and very rewarding when it works well. A particular enjoyment is to look at a selection of books I have made all in a row. I like the part when I have made all my marks and incisions, the panels are ready and I’m set to sew. That’s my favorite part of a Coptic bind. With closed spine bindings, I like to pull the book out of the press and open and close it lots of times, polish it up and finish it off with embellishments – which takes time as I have lots of bits and bobs lying around! What inspires your work? Do you have a special way or place to go where you get ideas? I’ll visit all sorts of sites, bookbinding museums, galleries, online libraries. I love to go to junk or thrift stores and scour the shelves, I get so inspired. Books don’t necessarily make me want to make books, I see an old leather Chesterfield couch and want to sit in it – that might inspire me to make a book that is equally as nice to write in as the couch is to sit in. It’s about a complimentary thing I suppose. I love anything old and different! I have kept a journal since I was 12 years old, writing all sorts of things to myself; I grew to adore my journal particularly when traveling; I’d sit in cafes with it and write screeds over coffee. I always write with a 0.05 Staedtler pen, as I am left handed and it doesn’t leave a smudge. If I liked it a lot I would make my writing ridiculously small towards the end so I could prolong its life; all the words would be squashed together. I made my first book when I was about 19; it was a Coptic binding with vintage postage stamps on the panels. I still have it and it’s full of ramble. :) I was studying photography at the time and took an elective in book arts. 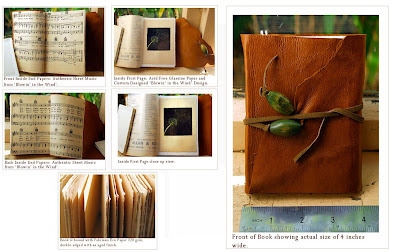 Over the next several years I made a few books by looking at the way my bought journals had been made. 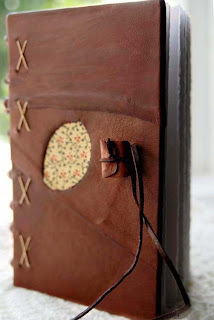 I found over that time that I wanted a particular kind of journal; a leather one that looked old and worn. I was so inspired whenever I saw anything like this. It made me want to write about anything, freely – it unblocked fear. I found my Staedtler pen only looked and felt really wonderful on particular papers and I so looked forward to writing in a journal that fitted that description. But they became hard to find and very costly when found! I started making my own at this time, also to put my photographs in. It was while I was studying for my Honours Degree in Photography that I took a couple of evening classes in Bookbinding which really got me going. I took to it like a sponge and became addicted to making books. I didn’t sell my first one for another year as I wanted to keep them all! I had all these books everywhere and thought maybe I should let them go. I would give them away as gifts quite a lot. I started selling them at markets before I began on Etsy. So you are a photographer by training? I have a BA (Hons) in Photography, and graduated with distinction. Photography is my passion; I’m a bit of a black and white purist at heart. I have an old Rolleiflex Twin Lens 6 x 6 camera from 1952, and still use it. It’s been to Paris and outside Henri Cartier-Bresson’s front door. I worked in the professional photography industry in Australia before returning to New Zealand to pursue my own creation – at the time I wasn’t sure what I was getting up to. I experimented a lot when I came back with all sorts of ideas. Once I had it I got on a roll, and I suppose eventually things took shape; you just let it go where it goes. I do photographic work as well as craft markets on the weekends. Is there one book among your works that you are especially proud of? I made a book once which I called ‘Blowin in the Wind’. The endpapers were the authentic vintage sheet music from Bob Dylan’s ‘Blowin’ in the Wind’, and it had my image of a dandelion of the same title on the inside cover. I sold it on a trade website here in NZ, to an avid Bob Dylan fan who loved it so that worked out famously. 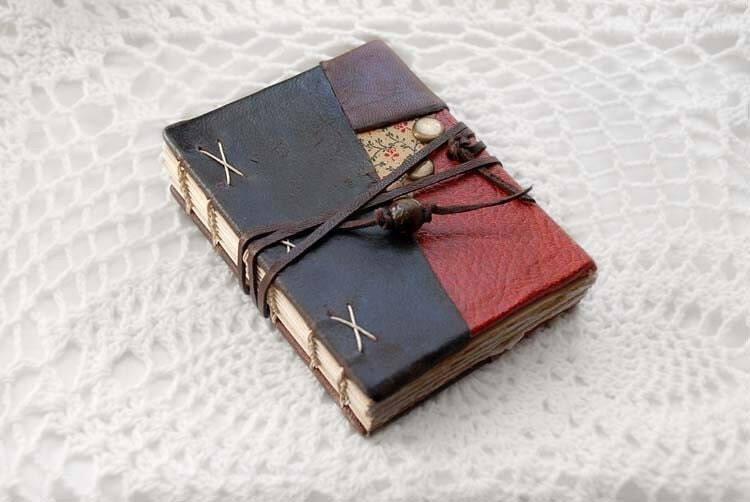 My most favorite book however that I have made was my ‘Journaling Gypsy’ which sold last year on Etsy. It had a tiny baby version of itself on the front panel. Thank you for sharing your stories with us! There is just one bit of information left I would like to ask (I always like this bit): Please explain your Etsy-name to us. Bibliographica stemmed from a thought about me as a book or thesis. So it’s the bibliography of me. 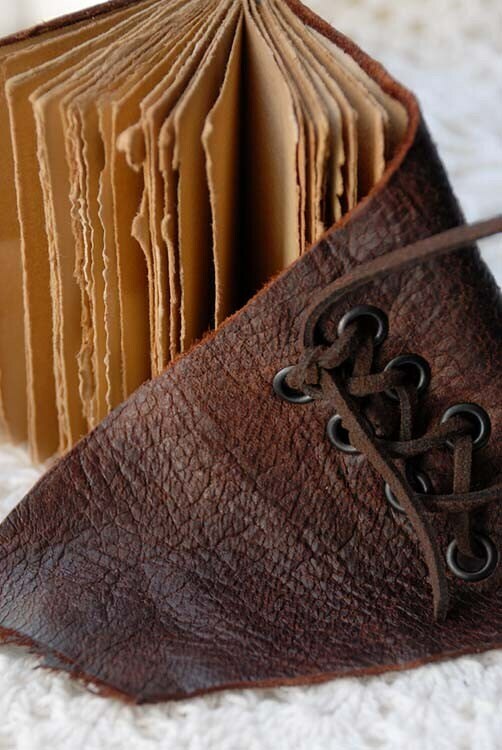 I’m an avid collector of things, and have always been drawn to old books, paper ephemera, photographs, postcards – especially with beautiful ink fed handwriting on them… I am a bookbinder, photographer & bibliophile and it seemed that Bibliographica fit all these things. If you want to see more of Louise's books, check them out in her shop! Lovely interview and beautiful books! !